90% players use 6-7 sec heroes with only 1 creature to collect things around. Imagine if everything is trapped around, no one will find this funny. You want my advice? Players hate this type of objects or events. Because then they need to overuse autosave. phamlocace, the background must be 0.255.255, cyan. Thank you Salamandre, but still a little problem. The black point in blackground is too many, I'm tired to make all black point become 0.255.255. Do you have any way make it faster? Ex, with one click? Edited by bloodsucker at 09:21, 02 Sep 2015. Traps would be relatively rare and based on health besides other factors, at least with Invite-Tavern even if you lose some heroes from time to time it would compensate. And these chests (will look like people) are for non-sec heroes. The positive ones will give progressive experience (kind of dream teachers - each good meeting increases the experience gained by 500), more then one to prims, new secondary skills without limit and resource bonus based on hero's level, so you should collect them only with the heroes you want to develop. If I get the algorithm to the fights right it will be a "good" surprise, tons of money from brutes and skeletons/liches from necromancers. I'm going to do the battles in a way succubus will not get any creatures. Think of them more like Power Stones then like classic treasure chests. I wanted special scholars, the chests are a 'work around'. I was only speaking about random hidden events. In my opinion, battles pr other important events should be visible on a map, not hidden. There is nothing more raging than do a 10 minutes battle with main hero, then lose a secondary hero to a "20 rogues attack you from nowhere" filthy event without saving before. phamlocace,I told you you need all background to be cyan 0.255.255. 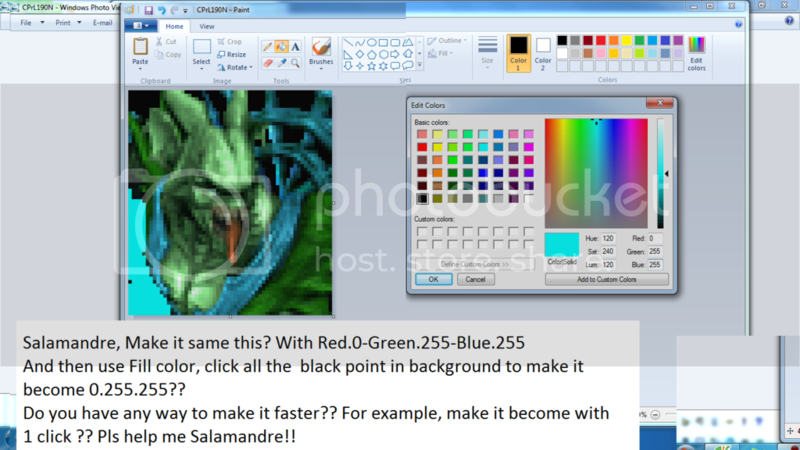 In order to achieve that use better graphical tools first, when isolating the image -paint.net does good job here-, then of course Photoshop in second, to be able to select all near-cyan colors in palette. And both, please, this is Era related thread. So where should these posts go? Not ERM Help for sure. Have short memory?. One of suggestions. Ok, sorry. I was already thinking of actualizing it anyway. Edited by Z at 11:29, 04 Sep 2015. Loading previously saved game works fine. Edited by Salamandre at 12:07, 04 Sep 2015. Ok, then put wog revised next to WoG, just above. This is the order of platforms, then try again. Also can you start that map when no mods? @ I tried a game with your config and map crashed before load, it needs some special setting from Sagamosa -I think Sagamosa is not for custom maps-. Then I tried to generate a random map and this time all okay. I put "revised" above WoG, it didn't work. Disabled all the mods - same thing happens. New maps were working fine until yesterday evening. Maybe it has something to do with recently played maps? I played "Snowlord" map last. Try a random map first. Is still crash, then no idea..
Edited by Z at 15:54, 04 Sep 2015. Nope. As soon as I click "new scenario", game crashes. I think I'll just reinstall the game. So.. I think i figured what was wrong. I deleted the game from my HD and made clean installation. Everything worked fine. Then I copied last few maps I've downloaded into "Maps" folder and figured out that it was only MY FAULT not to read map descriptions. It turned out it was HotA map. So, people, if you get any crashes, CHECK out types of maps you're downloading and trying to play. Hello fellow woggers. Long time player, first time poster. I know I read in a readme-file or post somewhere about a change to Homm3's AI and the range it works at. Some mod or setting had changed this from 2 to 4 or something like it, but I can't find the mod or setting no matter how much I search. I currently run 2 different installs: one with the mod manager using wog revised on top of the latest era 2 wog with the HD mod. The other install uses only era 2 and HD mod, no wog revised. Both my gf and I feel that the AI behaves differently on these installs. Is it just our imagination, or is there some part that changes the AI "detection range" or whatever the thing affecting ai behaviour is called? Also, is there a recommended random map for 8 players without portals? I really want to turn off or at least lower the amount of portals sometimes. Try some templates, Jebus Cross as far as I played didn't have portals. First I have no idea why you use two installs for era and hd mod. HD mod is compatible with Era and all vanilla versions, it creates a different executable to click on. Use only one install, and only add mods from mods list if you want to spice the game, you can disable or enable one hundred of them at any time. And sure, use wog revised all the time, you will save some time worth in crashes. Are u a girl? If u are a girl, let me love you, ok? Using two laptops, my gf insists that the ai behaves better on one of them and wont let me install wog revised on it. This lead to me thinking about ai mods and ways to change ai behaviour. Can't remember which mod it was that changed an AI setting from 2 to 4 squares for some reason. Just sure I saw something about it some time ago. Personally I run wog revised, xxl maps and hd mod. Gf only wants HD mod. Edited by qoty at 22:04, 21 Sep 2015. Hello, I'm a long-time player of Heroes and ERA. I have a lot of mods, mainly graphical but nevertheless the game occasionally crashes, mainly during battles.... and I can't find where crash logs are stored... if any.